The song gets its power from its poker-game tension between lyric and arrangement. As the words get more hopeless, the music raises its stake in the other direction, increasing the defiance and bombast. The worse this guy’s prospects look, the more the music is telling us he might still have a chance. Fights against all odds are what heroes do, right? So you could imagine “Against All Odds” done without the drum breakdown, and without its singer going all-in at the end – in fact it might be interesting – but that isn’t the route Collins takes, and Mariah Carey follows him closely. Her cover is of a piece with her “Without You”: a power ballad classic faithfully rendered, with a shot of vocal rocket-fuel. It’s striking, in fact, how little Mariah re-interprets the song: most of the major decisions that sound like they might be hers – the ever-extending melisma on each “now”, her pushing her voice to the point of cracking on the very final chorus, that last drawn-out “take”, and the rather deflationary, resigned ending – are there when Phil Collins sings it. He’s not the powerhouse she is, and he ends up sounding angry where she sounds steely – but hers is a strong, if conservative, version of a fine song. If only I was writing about it. I sort of am, of course – this collaboration is actually more of a remix, with Mariah Carey’s vocal line edited down and Westlife drafted to fill in the gaps that leaves. They were the bigger UK stars, kicking off the promotion for their second album, and they get to start the record off – but the sleeve doesn’t lie. They are the guest act here. And what a wretched job of it they do. It’s hard to see how arranging “Against All Odds” as a duet would help it in any circumstances – a song about abjecting yourself for an absent lover doesn’t really need anyone joining in. Let alone these five feckless sods: it’s a big song, but not that big. 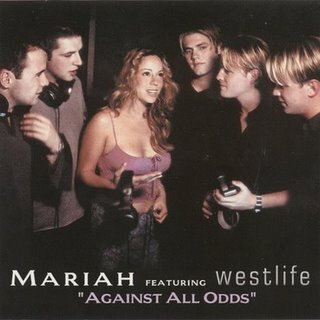 On the early verses it doesn’t matter too much – the singing is on the oafish side, but they’re not trying to have Mariah’s or Westlife’s bits communicate, so I can’t really fault that they don’t. And the song keeps Mariah’s best moment intact – her sad, soft reading of the first chorus. But when Westlife are drafted in as backing vocals on the final choruses, toes are very much being trodden on. Westlife footle around the edges of Carey’s delivery (”Taaaake…a…loook….”), unwisely try and take her on (”STANDING HERE!”), and settle in the end for just leeching any remaining drama from her vocals (”Chance I gotta take…gotta take”). Making the ending even smarmier – and throwing on one of those ubiquitous glimmering keyboard effects – is just a bonus. Mariah – or her record company – are just as culpable here: she wanted a hit, this was the path to one. For Westlife, it telegraphed two things: they were big enough to share billing, if not studio time, with a global megastar. And their second album would, if anything, be more conservative than their first. Nobody involved with “Against All Odds” was taking any chances. Except with quality. Interesting thing with racial coding of music there, #30! It’s safe to say a Phil Collins cover with Westlife is absolutely white-coded. The Westlife vocal contributions are at least decent initially. Of course, that still leaves them in the shadow of Mariah – whose technical merit would be a template for “reality TV” singing game shows, which makes it ironic this song appears again as the “winner’s song” for the most Collins-esque contestant, let alone winner, of such a show I can think of. But that’s several years (and multiple game show bunnies) away. Back to this version, and the problem is not even that Westlife are bad singers but intruders in what ought to be a solo song. It just doesn’t work narratively, and basically concedes as much by reducing the boys to stagey backing vocalists at the end. Even if this were in a musical, though – and a fine late-show anguished ballad it’d make, rather in the mould of “Memory” (deservedly the iconic song from Cats, and understatedly quite as rangy as most of Carey’s material!) it would’ve worked better as a solo number. Even the production is duller – the Carey solo version has a keyboard effect that doesn’t make the Westlife version, at least according to the version of each I’m catching on Spotify. One of the most cynical releases we’ve ever encountered (goodness knows there’s a few rivals coming up, though), and a clear downgrade on the original – but I can’t possibly say it’s on the same level of ruinousness as Five Will Rock You, and I think that deserved more than a 2 in retrospect. I’ll give this a 4. I remember a baffled reaction in the UK that Phil Collins might be perceived in America as an r&b icon. I’m not really qualified to comment on whether or not Phil Collins had da funk, but in his day he was a bloody good drummer – wasted on Genesis, even in their prog days. He’s never made a big deal of it, though. At the time I was slightly startled to see a drum credit for PC on “No one receiving” on Eno’s Before and After Science – albeit not as surprised as I was by the percussion credits for Shirley Williams (seen here reminiscing with the artist). I don’t think I’ve ever listened to “Against All Odds” from start to finish. Even by Phil Collins’ standards it’s ponderous and it’s one of those songs that seems to go on for days. I would agree with the review on the main points. This song is ideally suited to Phil’s wallowing tones and it’s a rum choice for a cover as a duet. btw – Westlifer on the right is looking down her top. Dappy from N-Dubz is a British urban act who constantly talks about Phil Collins as an influence. The second N-Dubz album is even called Against All Odds. AAO is a strange and scary beast from my perspective. Seeing my own parents separate around the same time Phil was at his most “emotionally potent” and making middle-aged divorce ballads, seemed to sour my relationship with him as an Rock Star, who had beguiled with such drumming poise on Foxtrot and Lamb. He had broken out into solo territory as Gabriel had done, and proved himself to be an Massive Pop Star. As a family, we’d all liked Genesis, we’d all liked Face Value and No Jacket Required (although I think that came after the separation). It’s just something we all had in common. Dad had friends who moved in similar circles to the sound engineers who worked on Phil Collins’s solo albums as well as Genesis from about Duke onwards (btw, I’m not saying here that Dad knew Phil or Tony or Mike, personally, nor Hugh Padgham, but he knew people who did). I remember perhaps around Invisible Touch (of all albums) that the gates to my imaginary fortress of denial had been pulled down and the legions of reality came streaming in. Mum & Dad weren’t going to make it to the milestone 20th anniversary. As Phil was wallowing in his own self-pity, so indeed were we all, neck-deep in it with him, retreating to our own pursuits. And eventually I would have to split my time equally between both warring factions, as well as try to get on with my own life and do the things that all young adults did. Some of my efforts succeeded and others failed. C’est la guerre, I guess. It was AAO that was particularly emblematic of those times. For all of us. Re41: Reeves was massive in the Caribbean, too, something I’ve been reminded of rereading Jeff Chang’s hip-hop history Can’t Stop, Won’t Stop (a considerable number of hip-hop pioneers had parents who came from the islands or had been born there themselves*). How much writing has been done on this subject in particular? I’ve found a journal article titled ‘Yes, It’s True: Zimbabweans Love Dolly Parton’ but haven’t read it yet. *Traditional fuel for Tim Hopkins’ hip-hop is a reggae off-shoot theory. This was #1 the day I started university which is disappointing in many ways. I used to be a huge Phil Collins fan, although I haven’t listened to his music in years. If you asked me to say which was his best song, however, ‘Against All Odds’ would be up there. Not just for the song, but I loved the movie it came from. Oddly, I don’t think I’ve ever heard the Mariah Carey/Westlife version. Worlds most glorified covers band Westlife. A great song and although some of Westlife can sing they lack the personality of Collins original vocals.